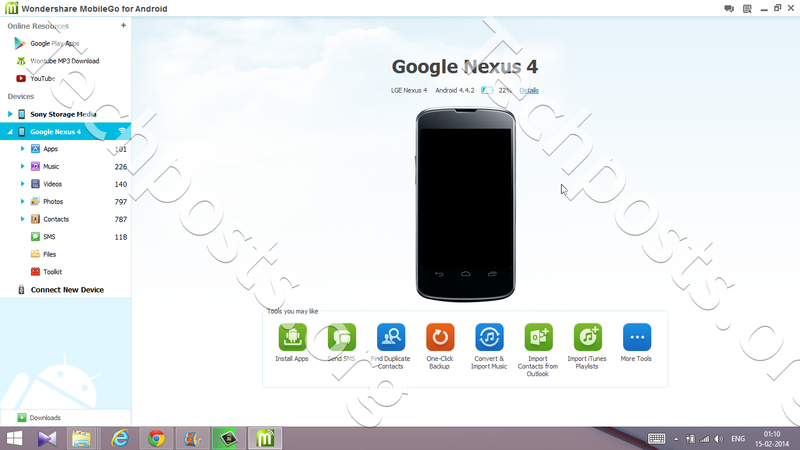 PC Suite For Android : Have you ever felt that your Android Smartphone screen is not enough for managing all the stuff? You might have if your Smartphone is a small one. What do you think about connecting your phone to desktop and using the large screen for controlling Android? 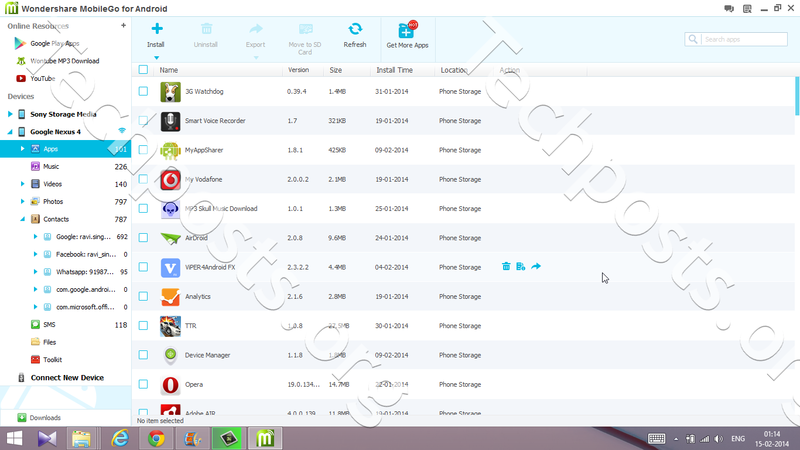 If you are a Samsung user, you might be familiar with Samsung Kies, which lets you manage files, upgrade firmware etc. However, it is never able to provide complete controlling of your Android. Now, you have a better choice! Let us introduce you an awesome tool, MobileGo for Android. As their website says, MobileGo for Android is for managing everything on Android from your PC. Let us have a deeper look into this superb software for Windows. MobileGo – Let your Mobile Go! MobileGo is an application for Windows and Mac from Wondershare, a leading software developer. Using this software, you can manage media on your device; manage applications, completely backup data, etc with single clicks. You can download the software from their website with a free trial period of 15 days with all the functions. After which you will have to pay around $40 for continuing the service. Combining all its functions we mentioned above, MobileGo for Android is suitable for definition ‘iTunes for Android’. As you know, Apple iTunes is the complete PC client of your Apple Device. You can transfer music from iTunes to your android with this software.Now let us check out how to use this awesome tool for managing your Android-running Smartphone. As we said before, you can download MobileGo for Android from official website of Wondershare. We are now using the Windows version but Mac version is also available. 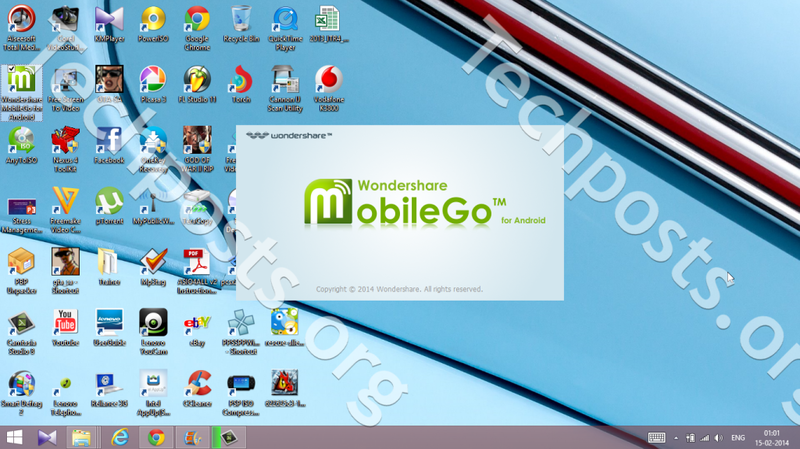 For installing MobileGo, you will have to install Wondershare Software Center. You can download MobileGo for Android via software center. It takes only seconds to install the software in your PC. Once you have finished installation, you can connect your Android to PC. There are two options available for connecting – over Wi-Fi or USB cable. For connecting over Wi-Fi, you have to install an application in your device. On the other hand, if you are using USB mode, you have to enable USB Debugging Mode (Settings à Applications à Development à Tick USB Debugging) and just use any of your USB Port. In seconds, the software would detect your device if you have done everything correctly. Installation may take some seconds according to driver availability and device support. After installation, you can see a dashboard like shown below. Here, we have used Nexus 4 running Android KitKat here. There are a few features in MobileGo for android, added for managing your Android device without even looking to the small Smartphone screen. Major features are as follows. This is the most useful feature I have found in MobileGo since there are some apps having features mentioned above. This tool has an awesome application management section, where you can back up your apps, restore them, share apps etc along with options to install and uninstall apps. Obviously, feature to backup and restore apps is much useful especially after wiping your device. For installing new applications in your device, you can make use of MobileGo’s Google Play Integration. 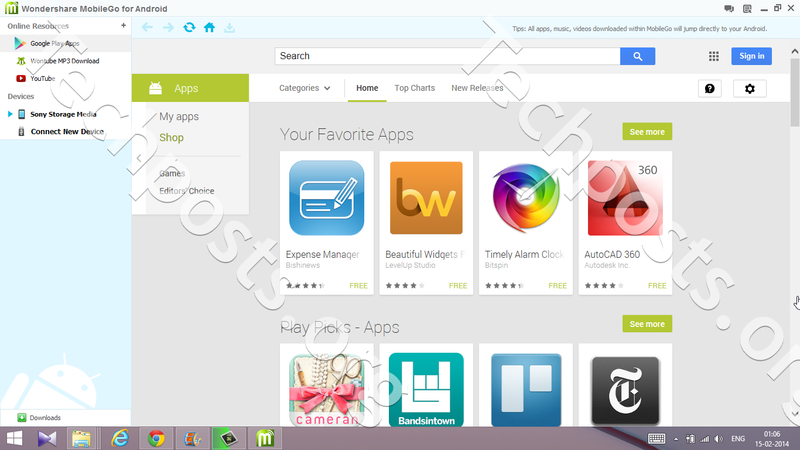 Using the official Google Play section, you can download Apps without fearing about virus issues. This is very useful if your PC has a good internet connection but Smartphone has not. 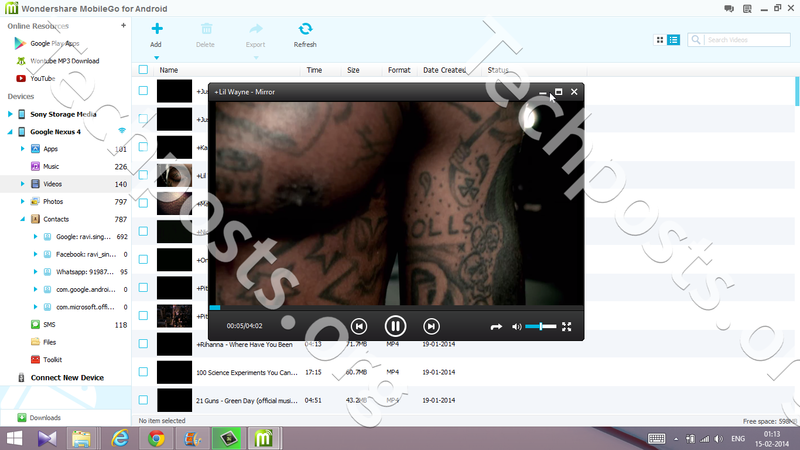 You can also manage various media files like music, videos, Photos etc via MobileGo for Android. 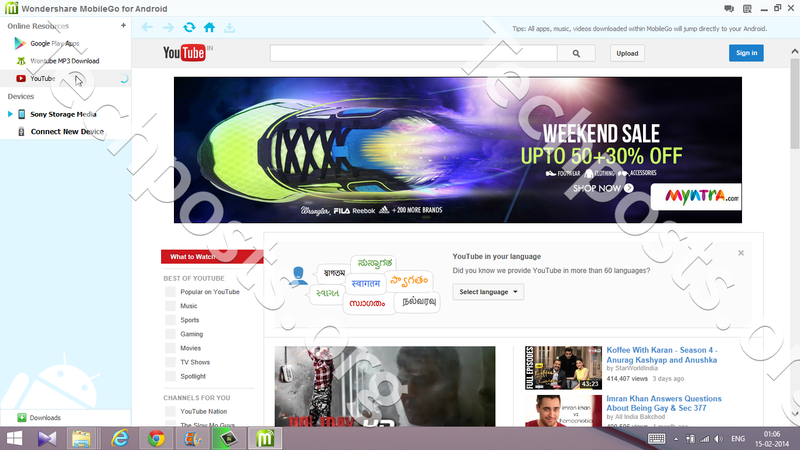 MobileGo has integration with YouTube, Wontube etc. 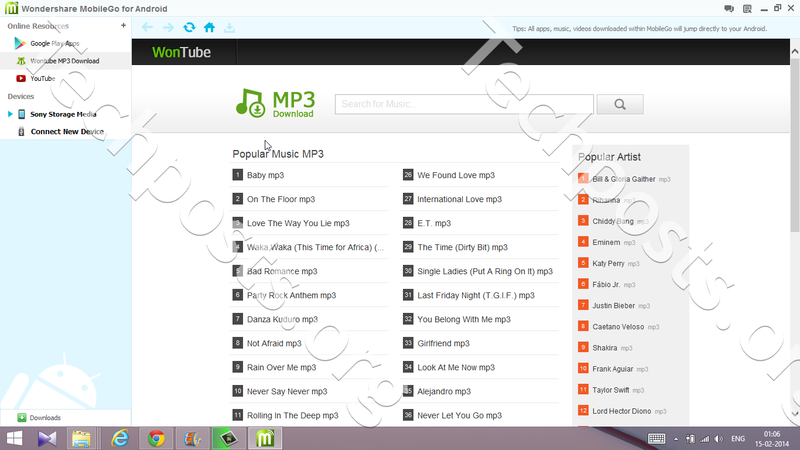 so that you can download videos and songs from those websites through single click. Of course, this feature is useful for music and movie lovers. In addition, MobileGo has an in-built video converter in it. This is indeed a useful feature! You might be having hundreds of contacts in your device, containing duplicate ones as well. In most cases, 4-inch screen of your Smartphone will not be enough for managing those contacts. MobileGo has integrated a contact manager with it. You can use the Contact Manger to edit contacts, delete duplicate contacts, merge contacts, add new contacts etc using your pc itself. This process is quite useful if you have such a large number of contacts in your device. In addition, contact manager can perform very well when you are shifting from your old phone from a new one. Sadly, this feature is not available for free version. Do you use SMS for sending critical data? Then you might want to preserve those texts from a sudden lose. In MobileGo, you can import and export messages between PC and device. You can make use of Group Texting to save time as well as to get rid of that small keyboard in Android. These features are indeed productive when you have no time to take the device and check for messages. Even though you cannot answer calls through computer’s microphone, you have two options for managing calls you receive. You can either reject the call or reject the call and send a text message along with it. Both these ways are useful if you are busy with PC works. This will be your first demand when looking for an iTunes alternative for Android devices. For at least some of you, data will be more precious than device. You can use MobileGo for keeping all your data safely. Once you have your device back, you can restore all the data using MobileGo itself. Analysing these entire features, of course, MobileGo is necessary software for Android lovers, especially if you care data than your device. 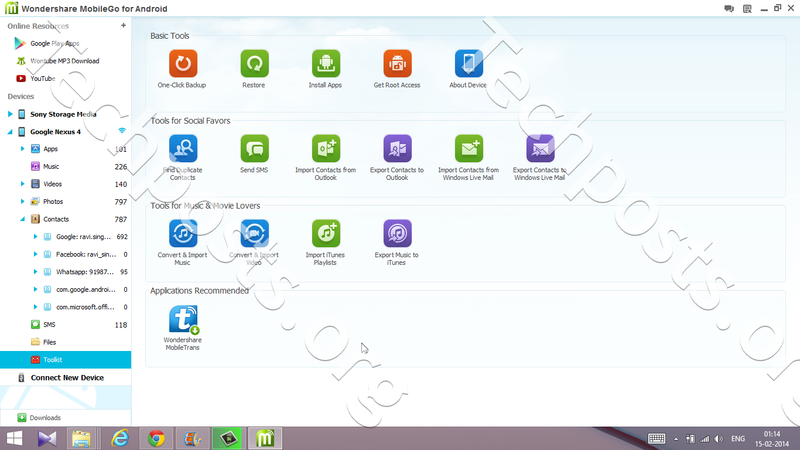 All features except that contact manager and video converter is available in the demo version. If you want to get all features, you can upgrade to premium version costing $40. Please Subscribe our Newsletter and Follow us on Twiiter and Like Us on Facebook. Visit Youtube.com/checknma for Video Tutorials, Reviews and Much More.